El Altar principal usualmente esta precedido de tres escalones, desde los cuales se hacen las Oraciones al Pie del Altar. Los altares laterales usualmente tienen solo 1 escalón. En Julio de 2007, El Papa Benedicto XVI promulgó el motu proprio llamado Summorum Pontificum en el cuál designó a la Misa Tridentina "como Forma Extraordinaria del Rito Romano", en oposición a la forma "ordinaria" o "normal", que corresponde a la Misa de S.S. Pablo VI, denominada usualmente como Misa Novus Ordo.​ ​ Desde entonces, la Liturgia Tridentina ha sido generalmente mencionada "La forma extraordinaria" (o también, "el rito extraordinario"). Las Formas de la Liturgia de la Misa previas a 1570 se conocen como Misas Pre-tridentinas. Also, most Old Catholics say the Tridentine Mass in either the vernacular or Latin. At the time of the Council of Trent, the traditions preserved in printed and manuscript missals varied considerably, and standardization was sought both within individual dioceses and throughout the Latin West. Standardization was also required in order to prevent the introduction into the liturgy of Protestant ideas in the wake of the Protestant Reformation. Beginning in the late seventeenth century, France and neighbouring areas, such as Münster, Cologne and Trier in Germany, saw a flurry of independent missals published by bishops influenced by Jansenism and Gallicanism. This ended when Abbot Guéranger and others initiated in the nineteenth century a campaign to return to the Roman Missal. Pope Pius V lived less than two years after promulgating his Missal, but in that time he himself, without fear of incurring the wrath of Almighty God and of the Blessed Apostles Peter and Paul, altered the Roman Missal that he had promulgated, adding to it the feast of Our Lady of Victory, a feast whose name his immediate successor, Pope Gregory XIII, changed to "The Most Holy Rosary of the Blessed Virgin Mary" (see General Roman Calendar as in 1954). Pope John XXIII changed its name to "Our Lady of the Rosary" (see General Roman Calendar of 1962). For the changes Pope Pius V made in the Roman Calendar, see Tridentine Calendar#Comparison with other Roman calendars. While he did not juridically abrogate the Missal of Pope Pius V, he replaced it with his own text. The first "typical edition" (that is, the edition to which printers were ordered to make their editions conform) of the Roman Missal was thus issued in 1570. The second typical edition was published by Pope Clement VIII in 1604, and in the third by Pope Urban VIII in 1634. Pope Leo XIII published another typical edition in 1884,​ with only minor changes, not profound enough to merit having the papal bull of its promulgation included in the Missal, as the bulls of 1604 and 1634 were. Essentially, therefore, Urban VIII's Missal survived for almost three centuries from 1634 to 1920, with the addition of many more saints' feasts. With the bull Divino Afflatu of 1 November 1911​ Pope Pius X made significant changes in the rubrics. This bull was printed in the next typical edition of the Roman Missal, issued by Pope Benedict XV in 1920, which also included a new section headed: "Additions and Changes in the Rubrics of the Missal in accordance with the Bull Divino afflatu and the Subsequent Decrees of the Sacred Congregation of Rites". This additional section was almost as long as the previous section on the "General Rubrics of the Missal", which continued to be printed unchanged. Although Pope Pius XII radically revised the Palm Sunday and Easter Triduum liturgy, suppressed many vigils and octaves and made other alterations in the calendar (see General Roman Calendar of Pope Pius XII), he published no new typical edition of the Roman Missal, since the changes he made were intended to be followed by others. However, these changes were incorporated into new printings of the 1920 typical edition, in the same way that feasts instituted by Pope Pius XI were incorporated into such printings. The final typical edition of the Tridentine Missal was promulgated by Pope John XXIII in 1962, replacing both Pius X's "Additions and Changes in the Rubrics of the Missal" and the earlier "General Rubrics of the Missal" with the completely revised Code of Rubrics issued in 1960. This is the edition of the Roman Missal that in 2007 Pope Benedict XVI authorized for continued use as an extraordinary form of the Roman Rite. Changes made to the liturgy in 1965 and 1967 in the wake of decisions of the Second Vatican Council were not incorporated in the Roman Missal, but were reflected in the provisional vernacular translations produced when the language of the people began to be used in addition to Latin. This explains the references sometimes met in an English-language context to "the 1965 Missal". The missals produced by various printing houses almost every year were affected not only by the changes made in the successive "typical editions" but also by the many additions of new feasts to the liturgical calendar. However, these additions had no effect on the form of the Mass. In this field, Pius V's work in severely reducing the number of such feasts (see Tridentine Calendar) was very soon undone by his successors. Feasts that he abolished, such as those of the Presentation of Mary, Saint Anne and Saint Anthony of Padua, were restored even before Clement VIII's 1604 typical edition of the Missal was issued. Pius V had also, while keeping on 8 December what he called the feast of "the Conception of Blessed Mary" (omitting the word "Immaculate"), suppressed the existing special Mass for the feast, directing that the Mass for the Nativity of Mary (with the word "Nativity" replaced by "Conception") be used instead. Part of that earlier Mass was revived in the Mass that Pope Pius IX ordered to be used on the feast. The calendar was revised partially in 1955 and 1960 and completely in 1969, again reducing the number of feasts.​ But additions continue to be made. This rule of the Didache is still in effect. It is only one of the three conditions (baptism, right faith and right living) for admission to receiving Holy Communion that the Catholic Church has always applied and that were already mentioned in the early second century by Saint Justin Martyr: "And this food is called among us the Eucharist, of which no one is allowed to partake but the man who believes that the things which we teach are true, and who has been washed with the washing that is for the remission of sins, and unto regeneration, and who is so living as Christ has enjoined" (First Apology, Chapter LXVI). Asperges (Sprinkling with holy water, Psalm 51:9, 3) is a penitential rite that ordinarily precedes the principal Mass on Sunday.​ In the sacristy, a priest wearing an alb, if he is to celebrate the Mass, or surplice, if he is not the celebrant of the Mass, and vested with a stole, which is the color of the day if the priest is the celebrant of the Mass or purple if he is not the celebrant of the Mass, exorcises and blesses salt and water, putting the blessed salt into the water in the form of a cross once while saying, "Commixtio salis, etc." After that, the priest, vested in a cope of the color of the day, while the choir sings an antiphon and a verse of Psalm 50/51 or 117/118, sprinkles with the holy water the altar three times, and then the clergy and the congregation. This rite, if used, precedes the Prayers at the Foot of the Altar. During the Easter season, the "Asperges me..." verse is replaced by the "Vidi aquam..." verse, and "Alleluia" is added to the "Ostende nobis..." verse and to its response. "Confíteor Deo omnipoténti, beátæ Maríæ semper Vírgini, beáto Michaéli Archángelo, beáto Joanni Baptístæ, sanctis Apóstolis Petro et Paulo, ómnibus Sanctis, et vobis, fratres (tibi, Pater), quia peccávi nimis cogitatióne, verbo et ópere: mea culpa, mea culpa, mea máxima culpa. Ideo precor beátam Maríam semper Vírginem, beátum Michaélem Archángelum, beátum Joánnem Baptístam, sanctos Apóstolos Petrum et Paulum, omnes Sanctos, et vos, fratres (te, Pater), oráre pro me ad Dóminum Deum nostrum." (Translation: I confess to almighty God, to blessed Mary ever Virgin, to blessed Michael the archangel, to blessed John the Baptist, to the holy apostles Peter and Paul, to all the saints, and to you, brethren, that I have sinned exceedingly in thought, word, and deed through my fault, through my fault, through my most grievous fault (in Latin, mea culpa, mea culpa, mea maxima culpa). Therefore I beseech blessed Mary ever Virgin ... and you, brethren, to pray to the Lord our God for me.) The servers pray for the priest: "May Almighty God have mercy on you, forgive you your sins, and bring you to life everlasting." Then it is the servers' turn to confess sinfulness and to ask for prayers. They use the same words as those used by the priest, except that they say "you, Father," in place of "you, brethren", and the priest responds with the same prayer that the servers have used for him plus an extra prayer. The first line of the Gloria is taken from Lk 2:14. The Gloria is omitted during liturgical seasons calling for penitence, such as Advent and Lent, both generally having the liturgical color violet, but is used on feasts falling during such seasons, as well as on Holy Thursday. Between the Epistle and the Gospel two (rarely three) choir responses are sung or said. Usually these are a Gradual followed by an Alleluia; but between Septuagesima Sunday and Holy Saturday, or in a Requiem or other penitential Mass the Alleluia is replaced by a Tract, and between Easter Sunday and Pentecost the Gradual is replaced by a second Alleluia. On a few exceptional occasions (most notably Easter, Pentecost, and in a Requiem Mass), a Sequence follows the Alleluia or Tract. Before the reading or chanting of the Gospel, which, in the case of Mass celebrated with the people, Pope Benedict XVI has permitted to be done in the vernacular language, the priest prays: "Cleanse my heart and my lips, O almighty God, who didst cleanse the lips of the prophet Isaias...", a reference to Isaiah 6:6. In this passage, after being cleansed by the angel, Isaiah was instructed to prophesy. Before the sermon, the priest may make announcements, especially of marriages, requirements of the liturgical season such as fasting, events for the week, and requests to pray for the ill or deceased. If the Epistle and the Gospel have been read in Latin, it is customary also for the priest to read a vernacular translation of at least the Gospel, before giving the sermon. The sermon is required on all Sundays and Holy Days of Obligation. The altar servers and congregation respond with "Amen." "The Roman Canon dates in essentials from before St. Gregory the Great, who died in 604, and who is credited with adding a phrase to it.​ (See History of the Roman Canon.) It contains the main elements found in almost all rites, but in an unusual arrangement and it is unclear which part should be considered to be the Epiclesis. An oblation is an offering;​ the pure, holy Victim is now offered, with a prayer that God may accept the offering and command His holy angel to carry the offering up, and that those who will receive the Body and Blood "may be filled with every grace and heavenly blessing." "Agnus Dei" means "Lamb of God." The priest then prays: "Lamb of God, who takest away the sins of the world, have mercy on us." He repeats this, and then adds: "Lamb of God, who takest away the sins of the world, grant us peace." The Mass of the Last Supper on Holy Thursday has "have mercy on us" all three times. In Requiem Masses, the petitions are "grant them rest" (twice), followed by "grant them eternal rest." The priest asks God to look not to [our] sins but to [our] faith. He prays for peace and unity within the Church, and then, if a High Mass is being celebrated, gives the sign of peace, saying: "Peace be with you." "Go, you are dismissed." The word "Mass" derives from this phrase. The priest then reads the Last Gospel, the beginning of the Gospel of John, 1:1-14, which recounts the Incarnation of the Son of God. On certain occasions, as for instance at the Day Mass on Christmas Day, another Gospel passage was read instead because that Gospel is read as the Gospel of the Mass, but Pope John XXIII's revision of the rubrics decreed that on those and on other occasions the Last Gospel should simply be omitted. Tridentine editions of the Roman Missal also contained prayers recommended, but not imposed, for recitation by the priest privately after Mass.​ The Canticle of the Three Youths (Dan 3) is one of these prayers. Except in the Dialogue Mass form, which arose about 1910 and led to a more active participation of the congregation, the people present at the Tridentine Mass do not recite out loud the prayers of the Mass. Only the server or servers join with the priest in reciting the prayers at the foot of the altar (which include the Confiteor) and in speaking the other responses.​ Most of the prayers that the priest says are spoken inaudibly, including almost all the Mass of the Faithful: the offertory prayers, the Canon of the Mass (except for the preface and the final doxology), and (apart from the Agnus Dei) those between the Lord's Prayer and the postcommunion. At a Solemn Mass or Missa Cantata, a choir sings the servers' responses, except for the Prayers at the Foot of the Altar. The choir also sings the Introit, the Kyrie, the Gloria, the Gradual, the Tract or Alleluia, the Credo, the Offertory and Communion antiphons, the Sanctus, and the Agnus Dei. Of these, only the five that form part of the Ordinary of the Mass are usually sung at a Missa Cantata. In addition to the Gregorian Chant music for these, polyphonic compositions also exist, some quite elaborate. The priest largely says quietly the words of the chants and then recites other prayers while the choir continues the chant. Missa Cantata (Latin for "sung mass"): celebrated by a priest without deacon and subdeacon, and thus a form of Low Mass, but with some parts (the three variable prayers, the Scripture readings, Preface, Pater Noster, and Ite Missa Est) sung by the priest, and other parts (Introit, Kyrie, Gloria, Gradual, Tract or Alleluia, Credo, Offertory Antiphon, Sanctus and Benedictus, Agnus Dei, and Communion Antiphon) sung by the choir. Also, incense may be used exactly as at a Solemn Mass with the exception of incensing the celebrant after the Gospel which is not done. The separate celebrations then involved the building of many altars in one church and the reduction of the ritual to the simplest possible form. The deacon and subdeacon were in this case dispensed with; the celebrant took their part as well as his own. One server took the part of the choir and of all the other ministers, everything was said instead of being sung, the incense and kiss of peace were omitted. So we have the well-known rite of low Mass (missa privata). This then reacted on high Mass (missa solemnis), so that at high Mass too the celebrant himself recites everything, even though it be also sung by the deacon, subdeacon, or choir. Pius XII began in earnest the work of revising the Roman Missal with a thorough revision of the rites of Holy Week, which, after an experimental period beginning in 1951, was made obligatory in 1955. The Mass that used to be said on Holy Thursday morning was moved to the evening, necessitating a change in the rule that previously had required fasting from midnight. The Good Friday service was moved to the afternoon, Holy Communion was no longer reserved for the priest alone (as before, hosts consecrated at the Holy Thursday Mass were used) and the priest no longer received part of the host in unconsecrated wine. The Easter Vigil service that used to be held on the morning of Holy Saturday was moved to the night that leads to Easter Sunday and many changes were made to the content. In 1960, Pope John XXIII (1958-1963) ordered the suppression of the word "perfidis" ("faithless"), applied to the Jews, in the rites for Good Friday. He also revised the rubrics to the Order of Mass and also the Breviary. Two years later, in 1962, he made some more minor modifications on the occasion of publishing a new typical edition of the Roman Missal. This is the edition authorized for use by virtue of the Quattuor abhinc annos indult (see below, under Present status of the Tridentine Mass). Among the other changes he made and that were included in the 1962 Missal were: adding St. Joseph's name to the Roman Canon; eliminating the second Confiteor before Communion; suppressing 10 feasts, such as St. Peter's Chair in Rome (or, more accurately, combining both feasts of St Peter's Chair into one, as they originally had been); incorporating the abolition of 4 festal octaves and 9 vigils of feasts and other changes made by Pope Pius XII; and modifying rubrics especially for Solemn High Masses.​ Among the names that disappeared from the Roman Missal was that of St Philomena: her liturgical celebration had never been admitted to the General Roman Calendar, but from 1920 it had been included (with an indication that the Mass was to be taken entirely from the common) in the section headed "Masses for some places", i.e. only those places for which it had been specially authorized; but her name had already in 1961 been ordered to be removed from all liturgical calendars. The instruction Inter Oecumenici​ of 26 September 1964 initiated the application to the Mass of the decisions that the Council had taken less than a year before. Permission was given for use, only in Mass celebrated with the people, of the vernacular language, especially in the Biblical readings and the reintroduced Prayers of the Faithful, but also, "until the whole of the Ordinary of the Mass has been revised," in the chants (Kyrie, Gloria, Creed, Sanctus, Agnus Dei, and the entrance, offertory and communion antiphons) and in the parts that involved dialogue with the people, and also in the Our Father, which the people could now recite entirely together with the priest. Most Episcopal Conferences quickly approved interim vernacular translations, generally different from country to country, and, after having them confirmed by the Holy See, published them in 1965. Other changes included the omission of Psalm 42 (41) at the start of Mass and the Last Gospel at the end, both of which Pope Pius V had first inserted into the Missal (having previously been private prayers said by the priest in the sacristy), and the Leonine Prayers of Pope Leo XIII. The Canon of the Mass, which continued to be recited silently, was kept in Latin. Three years later, the instruction Tres abhinc annos​ of 4 May 1967 gave permission for use of the vernacular even in the Canon of the Mass, and allowed it to be said audibly and even, in part, to be chanted; the vernacular could be used even at Mass celebrated without the people being present. Use of the maniple was made optional, and at three ceremonies at which the cope was previously the obligatory vestment the chasuble could be used instead. Pope Paul VI continued implementation of the Council's directives, ordering with Apostolic Constitution Missale Romanum​ of Holy Thursday, 3 April 1969, publication of a new official edition of the Roman Missal, which appeared (in Latin) in 1970. Some Traditionalist Catholics reject to a greater or lesser extent the changes made since 1950 (see Traditionalist Catholic). None advocate returning to the original (1570) form of the liturgy, or even to its form before Pius X's revision of the rubrics, but some refuse to accept the 1955 changes in the liturgy of Palm Sunday and the Easter Triduum and to the liturgical calendar (see General Roman Calendar of Pope Pius XII). Instead, they use the General Roman Calendar as in 1954. Others accept the 1955 changes, which were introduced by Pius XII, but not those of Pope John XXIII. Others again, in accordance with the authorization granted by Pope Benedict XVI in Summorum Pontificum, use the Missal and calendar as it was in 1962. From the 1960s onwards, Western countries have experienced a drop in Mass attendance (in the United States, from 75% of Catholics attending in 1958 to 25% attending by 2002). These same countries also saw a decline in seminary enrollments and in the number of priests (in the United States, from 1,575 ordinations in 1954 to 450 in 2002), and a general erosion of belief in the doctrines of the Catholic faith. Opponents of the revision of the Mass liturgy argue, citing opinion poll evidence in their support, that the revision contributed to this decline.​ Others, pointing to the fact that, globally, there are more priests and seminarians now than in previous years (in 1970, there were 72,991 major seminarians worldwide; in 2002, there were 113,199), suggest that the apparent decline of Catholic practice in the West is due to the general influence of secularism and liberalism on Western societies rather than to developments within the Catholic Church. In 1984, the Holy See sent a letter known as Quattuor Abhinc Annos to the presidents of the world's Episcopal Conferences. This document empowered diocesan bishops to authorise, on certain conditions, celebrations of the Tridentine Mass for priests and laypeople who requested them.​ In 1988, following the excommunication of Archbishop Marcel Lefebvre and four bishops that he had consecrated, the Pope issued a further document, a motu proprio known as Ecclesia Dei,​ which stated that "respect must everywhere be shown for the feelings of all those who are attached to the Latin liturgical tradition". The Pope urged bishops to give "a wide and generous application" to the provisions of Quattuor Abhinc Annos, and established the Pontifical Commission Ecclesia Dei to oversee relations between Rome and Traditionalist Catholics. 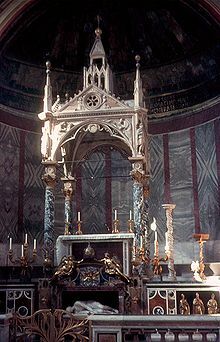 The Holy See itself granted authorization to use the Tridentine Mass to a significant number of priests and priestly societies, such as the Priestly Fraternity of St. Peter, the Institute of Christ the King Sovereign Priest, and the Personal Apostolic Administration of Saint John Mary Vianney. Some diocesan bishops, however, declined to authorise celebrations within their dioceses, or did so only to a limited extent. In some cases, the difficulty was that those seeking the permission were hostile to the church authorities. Other refusals of permission were alleged to have stemmed from certain bishops' disapproval in principle of celebrations of the Tridentine liturgy. As a cardinal, Josef Ratzinger was seen as having a particular interest in the liturgy, and as being friendly towards the older rite of Mass. He famously criticised the erratic way in which, contrary to official policy, many priests celebrated the revised rite.​ His election to the papacy as Benedict XVI in April 2005 gave new hope to Catholics who favoured the Tridentine Mass or wished to reform the Mass of Paul VI. Mass may be celebrated using the 1962 Missal on working days, while on Sundays and feast days one such celebration may also be held. The cardinal also said that the Vatican was preparing to instruct seminaries to teach all students the Tridentine form of the Roman Rite. The complexity of the rubrics makes it difficult for priests accustomed to the simpler modern form to celebrate the Tridentine form properly, and it is unclear how many have the required knowledge. Some Traditionalist Catholic priests and organisations, holding that no official permission is required to use any form of the Tridentine Mass, celebrate it without regularizing their situation,​ and sometimes using editions of the Roman Missal earlier than the 1962 edition approved in Summorum Pontificum. In order to provide for those who attend the Tridentine Mass, publishers have issued facsimiles or reprintings of old missals. There were two new printings of the 1962 Tridentine Missal in 2004 in the United States: one, with the imprimatur of Bishop Fabian Bruskewitz of Lincoln, Nebraska, by Baronius Press in association with the Priestly Fraternity of St. Peter; the other by the Society of St. Pius X's publishing house, Angelus Press. Some of the Missals reproduced date from before 1955 and so do not have the revised Holy Week rites promulgated by Pope Pius XII. Some traditionalist groups, in fact, reject Pius XII's liturgical changes. A complete list of Traditional Latin Masses was maintained after the Second Vatican Council by Mr. Radko Jansky in his Catholic Traditionalist Directory (last published in 1989) and then by Fr. Francis LeBlanc in his Directory of Tridentine Latin Masses (last published in 1992). Since 1994 the National Registry of Traditional Latin Masses maintains, updates, and publishes a list of all Traditional Latin Mass sites in North America (the United States, Canada, and Mexico) and contacts for such sites in countries outside of North America. The Directory includes the variations of position among the various traditional Catholic organizations and priests (Congregation of Mary Immaculate Queen, Diocese, Independent, Society of St. Pius V, Society of St. Pius X). ↑ Las condiciones para ello están indicados en un documento emanado por la Santa Sede con fecha 07 de Julio de 2007, denominado Summorum Pontificum. ↑ a b BENEDICT XVI (2007-07-07). Letter of His Holiness Benedict XVI to the Bishops on the occasion of the publication of the Apostolic Letter "motu proprio data" Summorum Pontificum on the use of the Roman liturgy prior to the reform of 1970. Libreria Editrice Vaticana. Consultado el 2008-03-24. ↑ Las más importantes formas litúrgicas no romanas que sobreviven aun son el Rito Ambrosiano, el Rito Mozárabe y el Rito Cartusiano o Cartujo. ↑ Thompson, Damian (2008-06-14). «Latin mass to return to England and Wales». The Daily Telegraph. Consultado el 2008-06-17. ↑ Is the Novus Ordo Mass Actually the Indult Mass? ↑ Cf. Extract from a Letter to a Philippine Mayor . ↑ "Just after the Council of Trent, the study 'of ancient manuscripts in the Vatican library and elsewhere', as Saint Pius V attests in the Apostolic Constitution Quo primum, helped greatly in the correction of the Roman Missal. Since then, however, other ancient sources have been discovered and published and liturgical formularies of the Eastern Church have been studied. Accordingly many have had the desire for these doctrinal and spiritual riches not to be stored away in the dark, but to be put into use for the enlightenment of the mind of Christians and for the nurture of their spirit" (Apostolic Constitution Missale Romanum). ↑ It is an additional ceremony, not part of the Mass itself, and in the Tridentine Missal is given only in an appendix. ↑ «Pope St. Gregory I ("the Great")». Catholic Encyclopedia (en inglés). Nueva York: Robert Appleton Company. 1913. OCLC 1017058. ↑ See discussion in Anthony Cekada: Russia and the Leonine Prayers, which considers that the obligation no longer holds. ↑ Pope St. Pius X said: "If you wish to hear Mass as it should be heard, you must follow with eye, heart, and mouth all that happens at the altar. Further, you must pray with the Priest the holy words said by him in the Name of Christ and which Christ says by him" (The Daily Missal and Liturgical Manual from the Editio Typica of the Roman Missal and Breviary, 1962, Baronius Press, London, 2004, p. 897). ↑ They gave responses to "Kyrie eleison", "Dominus vobiscum", "Per omnia saecula saeculorum", the Gospel reading, the "Orate Fratres", "Sursum Corda", "Gratias agamus Domino Deo nostro", the conclusion of the Lord's Prayer, the "Pax Domini sit semper vobiscum" and the "Ite Missa est"
↑ «Liturgy of the Mass». Catholic Encyclopedia (en inglés). Nueva York: Robert Appleton Company. 1913. OCLC 1017058. ↑ Pope Benedict XVI, who has several times deplored departures on private initiative from the rite of Mass established in the 1970 revision of the Roman Missal has declared this contention unfounded, writing: "There is no contradiction between the two editions of the Roman Missal. In the history of the liturgy there is growth and progress, but no rupture. ... Needless to say, in order to experience full communion, the priests of the communities adhering to the former usage cannot, as a matter of principle, exclude celebrating according to the new books. The total exclusion of the new rite would not in fact be consistent with the recognition of its value and holiness" (Letter to the Bishops on the occasion of the publication of the Apostolic Letter motu proprio data Summorum Pontificum). ↑ Brian Mershon, "New French traditionalist priestly society founded," The Wanderer, September 18, 2006. ↑ Article 1 of the motu proprio. In his letter to the Bishops he said: "It is not appropriate to speak of these two versions of the Roman Missal as if they were 'two Rites'. Rather, it is a matter of a twofold use of one and the same rite." ↑ Similarly, Clement VIII did not juridically abrogate the Missal of Pius V, nor did the other Popes who issued later typical editions of the Roman Missal before that of Paul VI (Urban VIII, Leo XIII, Benedict XV, John XXIII) juridically abrogate the previous editions. Even Pius V juridically abolished only those variants of the Roman Rite that had less than 200 years' antiquity. ↑ Indeed, "Mass should not be celebrated without a minister or at least one of the faithful, except for a just and reasonable cause" (General Instruction of the Roman Missal, 254). Masses celebrated without the people were once called "private Masses", a term that fell out of favour in the mid-twentieth century: the 1960 Codex Rubricarum, which preceded the Second Vatican Council, declared: "The most sacred Sacrifice of the Mass celebrated according to the rites and regulations is an act of public worship offered to God in the name of Christ and the Church. Therefore, the term 'private Mass' should be avoided" (Rubricae Generales Missalis Romani, 269). Cf. Review of Mass without a Congregation: A Sign of Unity or Division?, by Fr Marian Szablewski CR. ↑ In the letter to bishops by which he accompanied the motu proprio the Pope told them that the new regulations "do not in any way lessen your own authority and responsibility, either for the liturgy or for the pastoral care of your faithful." Cardinal Castrillón has stated: "The Pope has not changed the Code of Canon Law. The bishop is the moderator of the liturgy in his own diocese. But the Apostolic See is entitled to shape the sacred liturgy of the universal Church. And a bishop must act in harmony with the Apostolic See and must guarantee the rights of every believer, including that of being able to attend the mass of Saint Pius V, as extraordinary form of the rite" (30Days, June/July 2007). ↑ "Pope says old-rite Latin Mass should be on offer in every Catholic parish"
↑ Article 5 §4 of the motu proprio says priests who use the Missal of Blessed John XXIII must not be juridically impeded. Wikimedia Commons alberga una galería multimedia sobre Avgvstvs/MisaTridentina V2. Roman Missal for the Use of the Laity in English and also partly in Latin, published in London in 1806. Its Canon of the Mass includes the mention, by name, of the king. Esta página se editó por última vez el 16 sep 2017 a las 14:49.